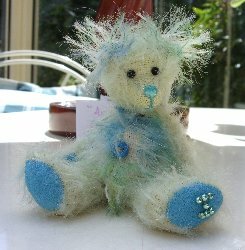 Let us introduce you to Ariel, a pretty little 3 1/2" bear made in the most gorgeous shades of green and blue. He is one of the latest bears in our Planets Collection and is made of very pale green felted mohair, quite sparse and scruffy. We have combined this for his tummy and ears with slightly longer, straight, hand dyed German mohair in shades of turquoise and green. Ariel has bright turquoise ultrasuede pads and paws, a turquoise belly button, shiny black German glass eyes and a turquoise stitched and heavily varnished nose. He is filled with steel shot for weight and has a wobble head joint for added cuteness! I hope you like him, he costs £36 plus postage. Please note that as with all our bears, Ariel is not a toy and is not suitable for children.